NASA’s Galileo spacecraft surprised scientists when it revealed that Jupiter’s moon Ganymede generated its own magnetic field. But new research shows Ganymede also creates incredibly powerful waves that rocket particles to enormous energies. Scientists revealed these huge electromagnetic waves while studying old data from Galileo, which orbited Jupiter from 1995 to 2003. The observations show another wild way that a moon can interact with the magnetic field of its planet. It’s a cool piece of science. Jupiter’s radius is around 11 times that of Earth, but it is perhaps 20,000 times more magnetic. This generates an intense radiation environment around the planet. The team of scientists analyzed Galileo’s recordings of the strength of chorus waves, electromagnetic waves observed in the area around Jupiter. Typically, these waves around Jupiter have an amplitude a little higher than that of the magnetic field produced by the human brain. But when Galileo passed by the 3,274-mile-wide moon Ganymede, the wave height spiked a million times, to perhaps the strength of a magnetic field produce by a kitchen microwave. If that doesn’t sound like a lot, Shprits compared it to a tsunami versus regular ocean waves. And these waves also appear to accelerate charged particles to extremely high energies, if they’re anything like weaker waves around the Earth, Bill Kurth, University of Iowa scientist in astronomy not involved in the study, told Gizmodo. 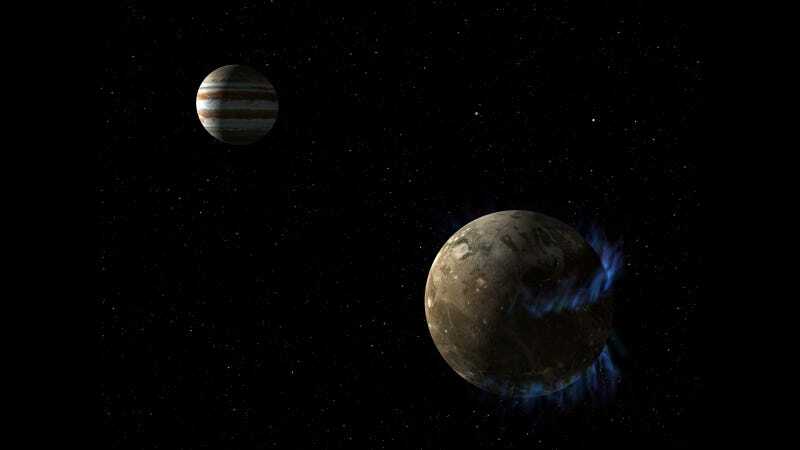 As to where the waves come from, the interaction between Ganymede and Jupiter could cause an uneven distribution in electrons surrounding the moon. This could supply the necessary energy to generate the large waves in the magnetic field. But it’s more complex than that, according to the paper published in Nature Communications. Moons without magnetic fields might make these kinds of waves also, though Jupiter’s moons Io and Callisto don’t. There are a host of different variables that could determine whether the waves exist and how big they’ll be, but determining all that will be up to future study. Why should you care about the environment around Jupiter? Well, first of all, it’s really amazing. But more importantly, the U.S. and Europe both have plans to continue sending probes to the planet, and the accelerated particles could wreck manmade technology. These results could also help scientists better understand the behavior of powerful magnetic fields and plasmas in general. Perhaps studying the radiation around Jupiter could help scientists find Jupiter-like exoplanets. Jupiter is a particle accelerator, its moon Europa may host life, and Ganymede has its own magnetic field that generates powerful electromagnetic waves. The system is an utterly inhospitable enigma.